Bremerton Police Lt. Pete Fisher, who was often the face of the department in times of crisis in the past decade, is set to become the police chief of Fife. Chief Steve Strachan announced the news in a department email this week. Fisher, 44, started as a line officer in Bremerton in 1998. He made sergeant in 2004 and lieutenant in 2006, where he’s remained. The job includes a lot of administrative work, including making shift schedules, conducting serious collision investigations and performing disciplinary reviews. Fisher also served as liaison to Redflex, the company that runs the city’s red light photo enforcement cameras. Fisher, a New Hampshire native, spent four years in the Air Force before moving to Puget Sound with his wife Christine, who was in the Army and got stationed at Fort Lewis. 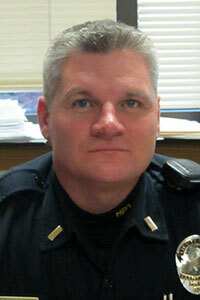 He started as a reserve officer in Ruston in 1994. Fisher’s duties as public information officer found him in the media spotlight on a few occasions, particularly during the hunt for a possible serial killer and the shooting of a third grader at Armin Jahr Elementary in 2012 (police have since found that the two fatal stabbings are likely not related). Fisher said he learned the importance of “being able to put out a clear message to people.” He also praised Strachan, saying he’s learned a lot from his boss that he thinks he can apply in Fife. Fisher will head a department that includes more than 33 police officers. He’ll also oversee its 34-bed municipal jail and its 12 corrections officers. Bremerton police will promote a sergeant to fill Fisher’s position.